In just over two years, half of the dolphins held captive at Dolphinaris are dead. Before opening, Dolphinaris was warned by ADLA and other groups about the danger of housing dolphins in the desert, but it placed profit over ethics. Kai died just one month following the death of Khloe. (and initially to Dolphinaris itself) requesting necropsy reports but were told that APHIS had not retained any of these records. 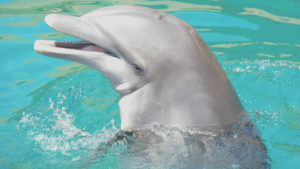 Following this fourth death, AWI submitted a letter to APHIS stating that it is crucial that an investigation into the conditions at Dolphinaris and a full health assessment of the remaining dolphins be conducted by a team that includes an expert APHIS veterinarian and an expert NGO veterinarian, as well as other external specialists. Dolphinaris needs to halt its money-making operations until the investigation is conducted, hopefully before another death occurs. Thanks to Arizona Republic columnist E.J. Montini for his piece on the death of Kai.